STEEL QUEEN is the story of a World War II tank commander in the British 7th Royal Tank Regiment. The story pick up in Arras, France in 1940. We follow him through battles against the Italians and Germans in North Africa in 1942. Each book can be read independently, or as a series. Tommy Fletcher is a cousin of Carl Johnsen, the main character in book one, STEEL ARMAGEDDON. In Book three, STEEL VENGEANCE, Tommy Fletcher participates in the Italian campaign in 1944 and 45. The description of the tank battles and types of tanks used are accurate in all the stories. 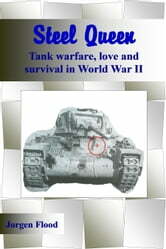 The story should appeal to all who enjoy WW II adventure stories and have an interest in tank warfare. Vivid descriptions of fighting from a tank. Escape and love story. Sad ending.